For years, Ron Galella, “the Godfather of American paparazzo culture,” has provided the world a glimpse into the off-limits world of celebrity. With Viva l’Italia!, a deeper and more probing Galella emerges. He sets out to find his own Italian roots, and in so doing, takes us on a viaggio as he combs his vast archive for images of Italian and Italian-American actors, artists, fashion designers, along with a wide range of other cultural icons. Galella’s tour begins in Rome’s famed Cinecittà where Federico Fellini relaxes between takes on a film set. It was Fellini who proclaimed, “paparazzi are bandits of images,” coining the word with his character Señor Paparazzo in La Dolce Vita. As he continues on, Galella presents us with rare portraits of Italy’s most famous sons and daughters, including Virni Lisi, Isabella Rossellini, Silvana Mangano, Marlon Brando, Monica Bellucci, Carla Bruni, and Sophia Loren. Never one to shy away from bad boys, he even includes the “Dapper Don” John Gotti, emerging from federal court in Manhattan. The appeal and power of Galella’s beautiful photography is complimented by extemporaneous quotes he has amassed over a half-century of travel and celebrity encounters. “You look Italian,” quipped Anna Magnani as Ron captured her in Rome, during the filming of The Secret of Santa Vittoria, with Virna Lisi and Anthony Quinn. 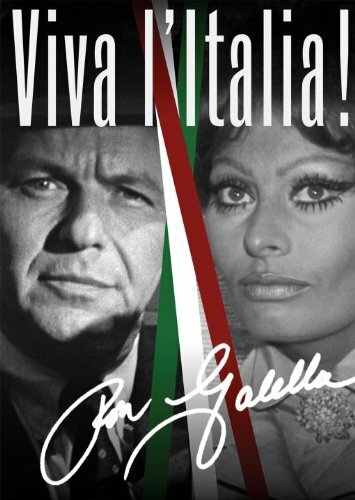 Some crossed the ocean, some changed their names, some were born in disparate locations as with Dean Martin of Steubenville, Ohio, and Frank Sinatra of Hoboken, New Jersey; but they all brought with them passion born of Italy—love of cinema, music, art, and fashion—as Galella triumphantly proclaims with Viva l’Italia!